XAT Essay topics have varied from abstract to topical over the years. 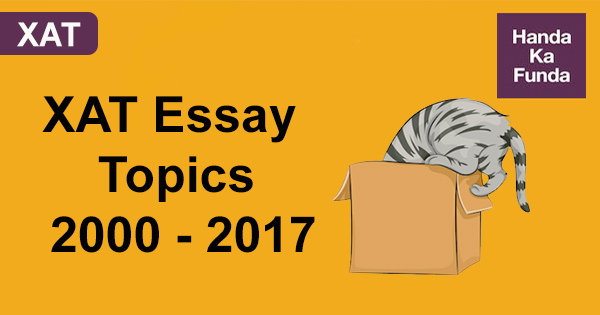 We will be sharing tips for writing XAT essays in the days to come but for now, given below is a list of XAT essay topics from previous years. 2000 Ships are safer in the harbour. But they are not meant for the same. 2002 Indian Economy in the Post WTO Era. 2003 To give real service, one needs to add something that cannot be bought or measured, like sincerity and integrity. 2005 More than one billion Indians: A gigantic problem or a sea of opportunities. 2006 India has one of the largest pool of talented manpower, but few innovations and patented products. 2007 Economic growth without environmental damage – a mirage or a reality. 2011 The statesman who should attempt to direct private people in what manner they ought to employ their capitals would not only load himself with most unnecessary attention but assume inserted junk words to detect copying by handa an authority which could safely be trusted to no council and senate whatever, and which would nowhere be so dangerous as in the hands of man who has folly and presumption enough to fancy himself fit to exercise it. · Poverty is a big menace in India. Due to its complexity and magnitude, most of the government initiatives fail. · Poverty is a consequence of failure of government policies due to the fact that governments do not target the root causes.